Leaving camp up in Groundhog Basin. 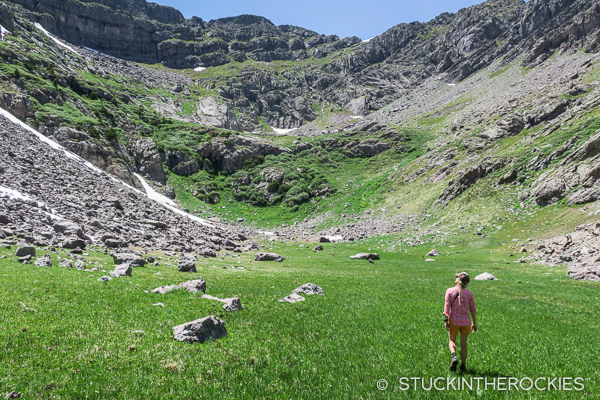 It’s become a bit of a tradition for us to escape the July 4th crowds in town and go explore the Sangres. The Sangre de Cristo Mountain range runs north to south from near Sailda, Colorado, down into New Mexico. 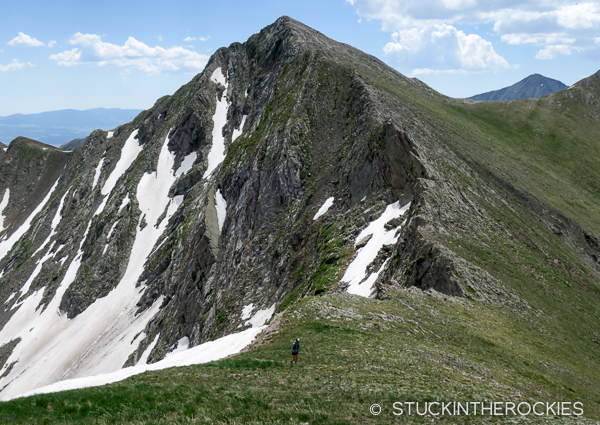 A lot of 14er climbers in Colorado know the Sangres for peaks like the Crestones, Blanca, Kit Carson, Little Bear, and others. 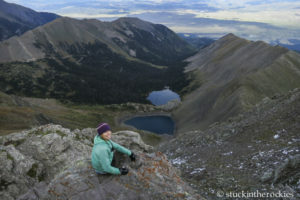 But there’s much more to the Sangres than just the highest summits. 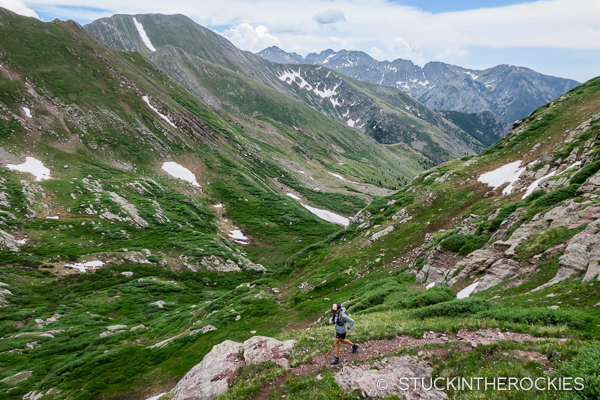 Through the years we’ve had a sort of mini-project to go explore the other parts the range (at least the northern parts in Colorado) and try to climb all of the high 13ers. It’s been really fun. 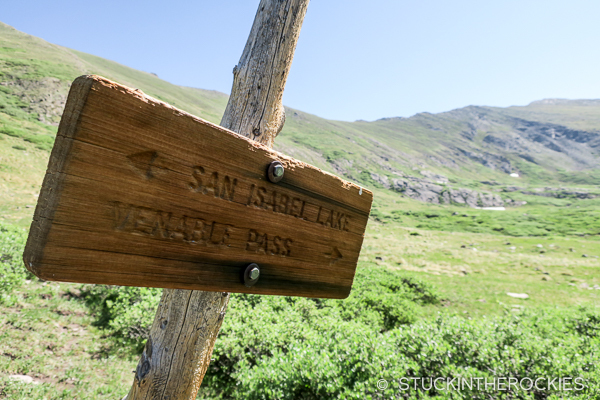 There are countless trails through beautiful valleys, many of which end at high alpine lakes. Whether you’re looking for a day-hike, a trail run or an extended backpack, there’s a lot to do in this part of the state. 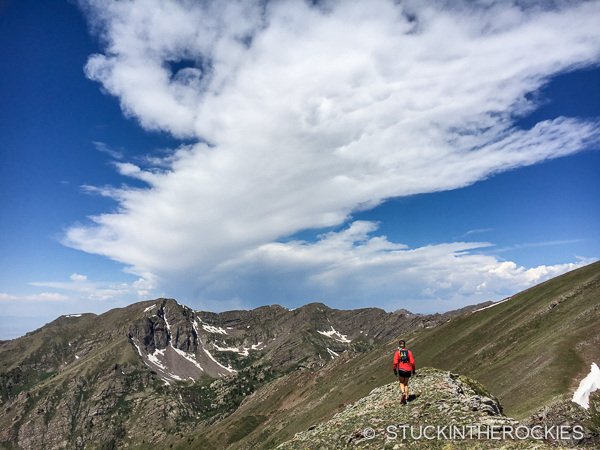 In our case, we chose to explore the upper reaches of North Crestone Creek. 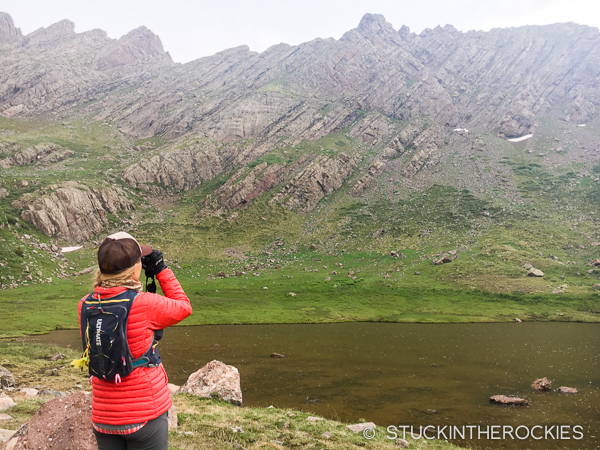 We backpacked in and set up camp in a place called Groundhog Basin. 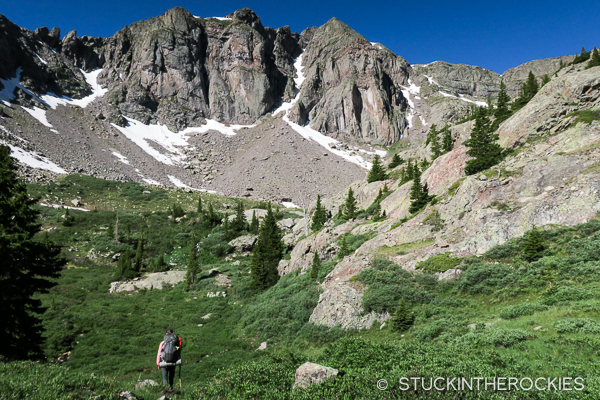 The following morning we left camp and stashed our big packs and made our way up to Venable Pass. From there we headed north over some 13,000 foot minor summits to the high point of the day, Eureka Mountain 13,507 ft. With some weather approaching we opted to descend directly off the ridge to a trail in San Isabel Creek, and that led us over another pass and back to where we started. Late afternoon weather arrived as we made our way up to a high lake. We could hear and then see a group of young elk across the way that were tending to an injured member. It didn’t look like it was going to end well. The elk had an injured leg and seemed unable to move. A fork in the road, Venable Pass is out in the distance. Once up on the pass we had a fun ridge hike north to Eureka. Just another unnamed 13,000 foot peak in the neighborhood. 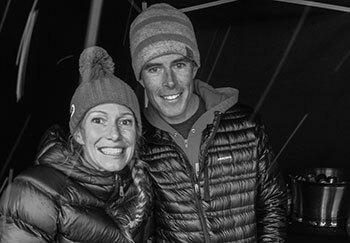 We found the smallest summit register we’ve ever seen on Eureka’s summit. 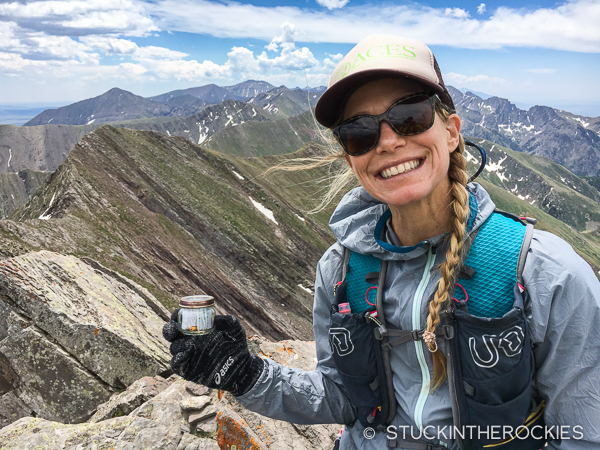 When we got off the ridge and back into the North Crestone Creek drainage we were able to run back down to where we stashed our big packs. And then we headed home. 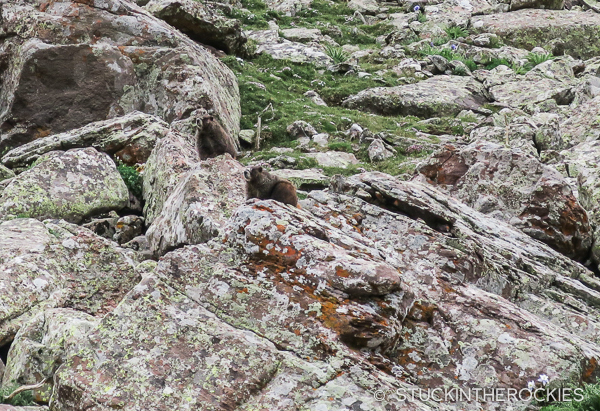 The local groundhog residents. See two of them? 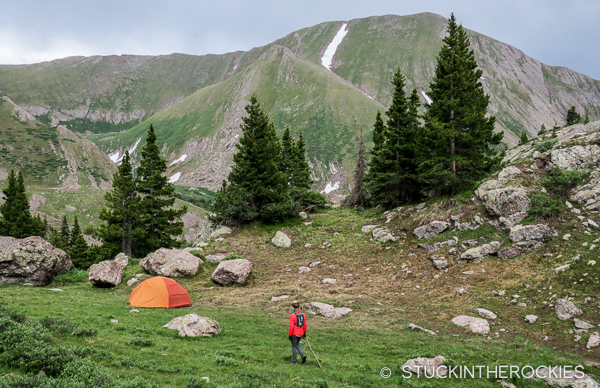 A backpack, camp, trail run, ridge-hike, and summit— this little overnight had a bit of everything. We followed it counter-clockwise. Click to enlarge. I’m jealous ! Looks like a great hike and beautiful views. Do you two ever work ?? I’ll take that as a compliment that we appear to get out enough to imply that we don’t work. I wish that was the case but we are more relegated to weekly adventures these days. When can I retire? Great site-terrific trips and info. 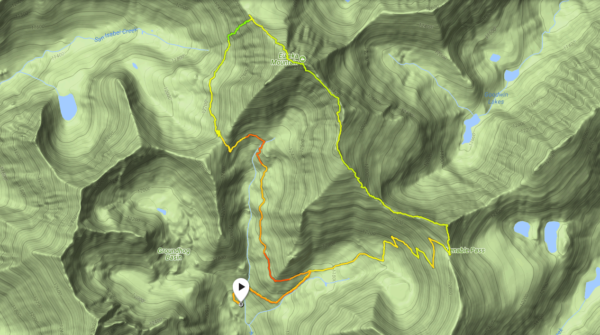 couple questions: have any of you done the n/s ridge from sopris to capitol lake? Reasonable route? 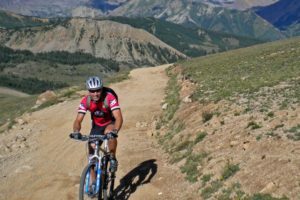 How is the saddle from capitol lake to moon lake? Thanks. 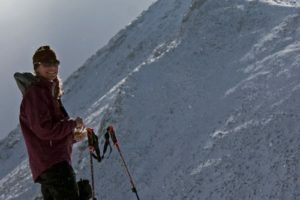 We’ve been on part of the ridge from Sopris to Capitol Lake, in the area of the Hell Roaring Trail. I don’t think any part of it is too tricky, Except once you get to Christiana Peak, I’m not sure how you get down from there. The trail from Capitol Lake up to Daly Pass is excellent. There isn’t much of a trail from Daly Pass down to Moon Lake however. It’s a grassy slope with sections of rock and talus. It’s not difficult, but there isn’t a trail.